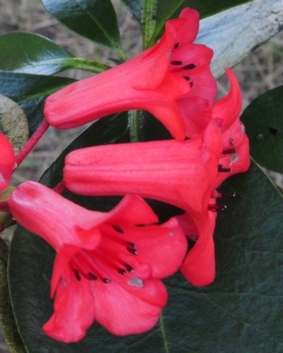 Our Rhododendron viriosum are flowering again (autumn to winter and late spring/early summer). They really were showy around Christmas. This is a lovely small plant for that shaded moist well drained spot. A similar plant species originating fro a nearby area is R. lochae. Although native to high peaks in North Queensland it will even grow happily down the coast to Melbourne. They grow well in pots in potting mix.